Spain's sovereign spreads are at the widest levels since November of last year. But Italy's widening is not keeping up. 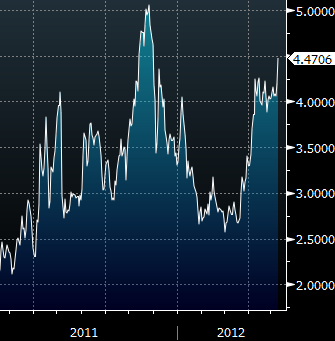 The Italy-Spain 5-year spread is now at -34bp - the lowest level since early July of last year. That means that the periphery spreads are not widening at the same rate. The markets have singled out Spain as the key risk for the Eurozone. In particular market participants are becoming increasingly concerned with Spain's banking system (see this post for more on the topic) that is buckling under the weight of the collapsing property market. Bloomberg: - Spain’s government will make banks set aside more provisions to cover real estate loans that are still being paid in the latest effort to bolster confidence in the financial industry. The rules, to be approved at a Cabinet meeting on May 11, will increase provisioning levels on healthy real estate lending to about 30 percent from the 7 percent set out in the Feb. 3 banking decree, said a person with knowledge of the situation, who declined to be named because the new rules aren’t public. The rules may create additional provisions of about 30 billion euros ($38.8 billion), the person said. Prime Minister Mariano Rajoy is pushing banks to recognize more losses on real estate as he also imposes a management change and possibly a partial nationalization at the Bankia group, the lender with the biggest Spanish asset base and most real estate on its books. Spanish bank shares plunged as investors considered the impact of forcing lenders to add to 53.8 billion euros of provisions and capital against real estate already ordered by the government in February. As capital requirements increase, the Spanish government will need to borrow more than it planned in order to bail out the banks. But it's a vicious cycle because it is the Spanish banks that lend it money by buying government bonds. As these bonds trade down, Spanish banks take further losses on a mark to market basis - needing more capital (see this post for further discussion on bank-sovereign linkage). And without more LTRO funds made available by the ECB, there is a limit to how much more debt these banks can buy (see this post for more on the topic). 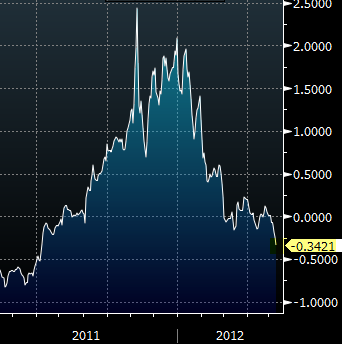 With expectations of higher supply of sovereign debt and no real buyers, Spanish spreads continue to widen.